During National Science Week, the Australian Meteorological Association (AMetA) and the Bureau of Meteorology presented “WOW – What’s the Weather?” at the Waite Campus. 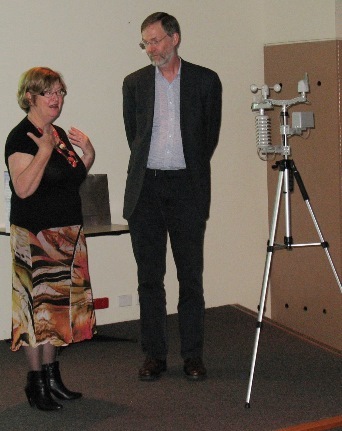 Paul Lainio and Mark Seaborn from the Bureau described weather forecasting, and the valuable role that people can play in observing and recording the weather using low-cost weather stations. The Waite Campus will join the WoW network with a weather station donated by AMetA. This entry was posted in News, School of Agriculture, Food & Wine. Bookmark the permalink.